Greetings. When you last saw me, I was playing with the MYO gesture control device in an old C++ project. It seemed pretty responsive and because I have the device and haven’t done much with it, I’m going to be using it in another project this year. For this project, I will be attempting to make a game where you can play on your mobile device with audio feedback only (maybe MYO vibrations too). Basically, no visuals. The idea of the project is to create a prototype and write a report about the findings of creating the game and whether the MYO can be used to engage the user without visual feedback. The hard part of this project would be to measure the engagement of the users. After some research, there are many ways that this can be done, and there are many people that study this type of thing. I believe after enough research, I can figure out a good method of achieving engagement in the game users. In the report I will be comparing different human motion capturing devices such as the Nintendo Wii, Xbox Kinekt, Razer Hydra, and an upcoming product called the Perception Neuron. However, most of these don’t have the required specificatios needed for a game like the one proposed. The Perception Neuron, for example, uses wifi to connect to a PC that does the game simulation, rather than bluetooth which is what the MYO uses. There are a couiple of audio-only games that spring to mind. One in particular is Papa Sandgre and Papa Sangre II by game company “Somethin’ Else“, where you play a game without visuals to hear the direction you are facing and various enemies. Another audio game is “Zombies: Run!” and “Zombies 5k”. These both engage the audience using a story told through audio, plus getting the player to do certain activities like leg raises or sprinting from a group of zombies. In Zombies, Run!, they also include a base that you can build up by adding resources they they collected during the jog. As always, I want to make due dates for certain sections of this project. Below is a matrix of milestones. 4 27 August – Report intro, abstract and formatting complete. 5 3 September – Myo gestures and movements implemented. 6 10 September – Research on gesture devices and audio games complete and drafted in report. 7 17 September – Mobile version working to test with, including sound effects. 1 boss fight. 8 24 September – App tested with users and findings added to report. 9 1 October – Draft of report done – more testing completed if necessary. No more adding to report – polish only. 10 8 October Report due Report completed and submitted. 14 5 November Working prototype due Working prototype complete and submitted. 16 19 November – Draft presentation complete – prototype polished for presentation. 17 25 November Presentation day Final presentation complete and presented. Would this game enhance your exercise routine if it incorporated GPS and jogging to a location? How likely are you to play the game out in the open where people could see you? (-3 to 3 where 0 is neutral, 3 is very likely or don’t care, and -3 is shy and would play it at home, maybe using a treadmill. How effective are the audio queues at providing proper feedback about the game world. (-3 to 3) : -3 makes it worse, 0 is neutral, 3 is makes it more fun and easier so you don’t have to look at the screen. How responsive is the Myo device at getting the correct gestures (spread hands, fist, etc.)? Anything that didn’t feel quite right? Any notes that would help improve the game? What was the most fun thing about the game? What was the least fun thing about the game? Would you buy a Myo if there were more games like this one? I will be adding more as the game develops, but as of now, these will be a good start at getting my report done. After last semester creating Cornstar, and working on Game Faming, I’ve begun to realize that CakePHP is more annoying to use than it is useful. Don’t get me wrong, it’s a good framework, and its helpers and security are great. The issue I have with it is that all my assumptions of what certain things do when typing them are usually wrong, and it takes longer to get something stupid working by searching Google than it would be if I created the framework myself and knew everything about it. So, I’ve decided to use the MVC framework I developed for Cornstar instead of CakePHP. I received pretty good grades for it, so It can’t be all that bad. The advantage of this is that I know exactly how it works, and it stops me hitting any brick walls with knowing or having to search up how to properly use something in CakePHP. A disadvantage of this is of course, if I get stuck with something I can’t look it up. However, I know more about PHP its self than the CakePHP framework, so if I get stuck on any PHP treated thing I’d have to look them up. Luckily the PHP community is enormous. All and all I think switching to my own framework is the best option. So deciding to use the Cornstar framework, I will also need to be updating it, so it can be used in other programs. Ther way it is now is that some code in the main library of the framework is Cornstar specific, meaning to make the framework modular, I’d need to re-organise some parts, separating things that will not change. To achieve this, I will simply move the program-only files into a folder called “corn”. After looking around, the only reference to “corn” in the Linux world is one at some university. Ideally, if I decide to make my framework public, it’d need to be able to be installed via “apt-get install corn” for example. Therefore I will simply be calling the framework “Corn”. This is because it is based off Cornstar and a corn on the cob typically has a nice juicy golden array of kernels, which could represent the functions and classes of the framework. Also, who doesn’t love corn? After doing a big fat “todo” list for this project, it made me realize how important setting goals and giving them achievable time is. many times I’ve sat around stressing and trying to reach for the main goal of “project finished” but without smaller steps, it just feels like it’s unfinished ALL the time. It’s like trying to climb to the top of something without a ladder; the ladder has rungs, which can be treated as baby steps towards an ultimate goal. It’s also important to set a time or date for which something should be complete to stop feature creep and achieving the feeling of “done this on time” at the right time. The other night I made a list of things to do and a time limit in which I was to do them. I couldn’t meet the time so I kept pushing it forward but it helped me track how long I was actually spending on something which helps set reasonable time for the future. Programming time flies. So fast. Maybe because I enjoy it? I think what I’m trying to say here is basically: break tasks up and set a (reasonable) time limit to do them. It makes it a lot easier to manage and track time. Tracking time on things helps improve estimations on things. This means I can charge people more and not be late on projects. The initial plan for this is to first set up the localhost, set up databases and shiz, and then get a demo of the page layout and interface up and running. Another thing I want to do is to create unit tests in the actual application. This will help with debugging and make it easier to test things once another feature of bug is fixed. This is because commonly, when something in the code has changed, it causes something else to break. The way the unit tests will work is I’d set up a controller called “TestsController”, and it will simply contain a view called “All”. When going here (/tests/all) it will show test results. The tests will be for every component added by me. This benefits in many ways including making it easier to make sure everything is working on the slightly different live Unix server (compared to local Windows environment), and helps in re-factoring code. This Wikipedia article gives a good example about the design of unit testing that I want to try and achieve. To make tests easier, I thought of a possible database idea where there will be 3 databases on both localhost and the live server, one will be for the real data, and the other for tests. The test data will be manually removed and re-entered at the end of the testing. The reason why there’s 3 is because there needs to be a database that can have data wiped and added to from another database. SO there will be the live data, test data template (with sample entries) and the actual test data (that is copied from the template). Using MySQL allows me to copy data to a database from another one, but does not allow me to create a database using pure scripts, this is why there needs to be a spare database. The issue with the above is that I’d have to maintain 2 databases, having to re-enter test data every time I wanted to test it if the database changes. This should be okay, however, if the database doesn’t change much. After some research, I can see that this sort of testing is a feature of test driven development development methodology (TDD) where tests are written first and then specific results for each test need to be met in order for it to pass. The important part of TDD is the specifications. Therefore these must be made and use case diagrams should be done for most of them (the complex ones). This meas that perhaps the development methodology for this project could be TDD. Although, TDD seems like a good one to use, I am still in the process of researching others, and therefore I may change my mind of which one to use. But if I don’t, then using TDD in this project will be a good experiment, as long as I record results. As for the design documentation, I didn’t really change anything apart from the way the camera is set up. Thinking of Photoshop and Flash, they both don’t really have a “camera” of sorts, but instead just clunky ways to change the object size in the scene. I think for Plasmation I’m going to include a camera that acts like both a camera in a 3D editing software and Photoshop. The way this will work is the camera can be moved around in a sort of “camera mode” (holding right mouse button in the scene) and using WASD to move like a FPS game (and how Unity does it) except you won’t have control over the camera in another view, the view will ALWAYS be the camera. This saves on having to have the 3 tabs at the top of the scene (edit mode, scene, side-by-side). However it makes the design different as the user will now not be able to control the camera using a scene edit mode or anything. Particle Tool – Peer reviews! This week I focus on getting peer reviews. This means that anyone reading this is free to make comments, suggestions and constructive criticism. I’m posting to ask for feedback and opinions from artists in the games industry and hobby game artists for a tool I am developing for particle effect creation. This is not advertising or anything to buy my product, but a friendly hello and some opinions for a game programming degree assignment. The background is that there’s not many programs around that allow someone to easily create realistic sprites for their game’s particle system. Games these days seem to have nicer looking particles and engines are powerful enough to render animations and other warping effects. These sprites would require advanced animation programs like FUME FX and similar, After Effects, and hours spent in Photoshop. In addition to this, I find in tools like FUME, there’s a giant waiting time between setting up the effect and then having to render it all, only assuming how it will turn out in the end. Why do this when graphics cards are powerful enough to do almost all of this rendering? Look at game engines today like Unreal Engine 4. They are looking more and more realistic and this is because of graphics card power. So the tool I’m proposing is going to be an extremely simple tool that lets you paint particles of your choice of properties for smoke, fire or magic effects. It will then allow you to animate them by giving the particles random velocities or adding nodes that repel or draw in the particles to customise slightly. You can then export the animation as a sequence in a PNG ready for engines like Unity. The program will also be browser-based and use WebGL. One of the main focuses is going to be a live preview of the effect by utilizing the graphics hardware on the user’s computer. This will allow most of the effect to be rendered instead of it being represented as white dots and running at 1 frame-per-second. My goal is to have it run at 60 fps, but will settle for 30. So for example, you want a nice explosion animation and can’t afford stock animations or want something more personalised, you can open the website (browser based), create a particle type like fire, give it some velocity ranges, rotations, etc, then create a 10-million or so burst that you can step back and forth through and alter as you see fit. You can then add another particle type like smoke, and create a burst. You can then export it. You may be thinking “why not just use FUME FX? It’s better and looks great”. Well, you still can. Basically. The main differences with this tool though is that it’s aimed at game artists as FUME tends to be more of a video exporting tool. It also removes the huge interface of Maya or 3DS Max with all the tools that you probably won’t need. All you really need is a center point and a particle simulation and export. As stated, this is not just an idea, I’m going to be creating this, and have to for my degree, so any feedback is greatly appreciated. If you have any constructive criticism, let me know. I’m also going to ask some YouTubers that have posted some videos of FUME FX examples. This week I figured that my plans were a bit off as I realized that I’ve been mostly doing framework programming in the last 2 weeks and unable to actually do much of the front-end. So this entry will be mostly about my research with the “model / view / controller” frameworking and a little bit of front-end work. 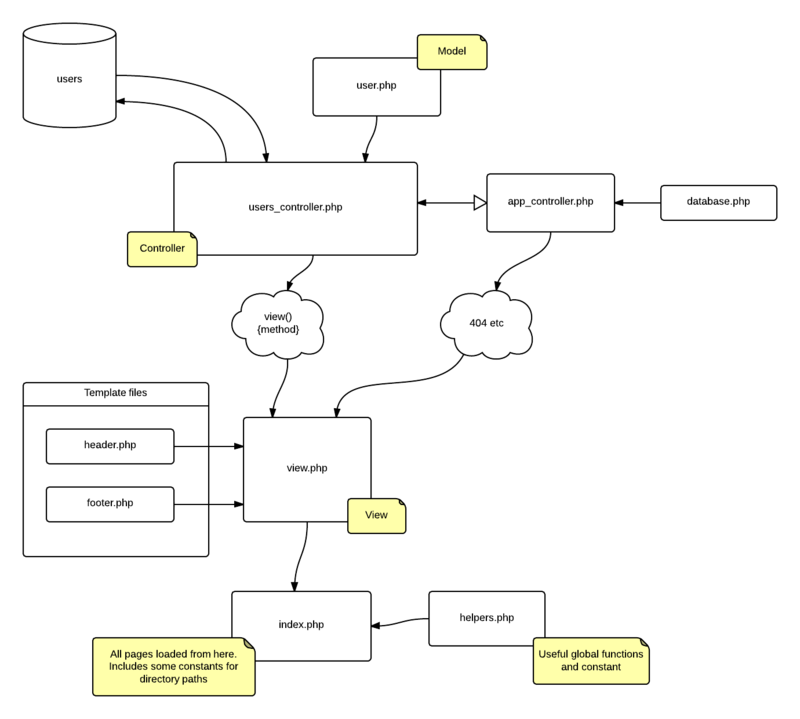 As the title says, I’ve spent some of the week looking at how “Model / view / controller” frameworks can work in php. 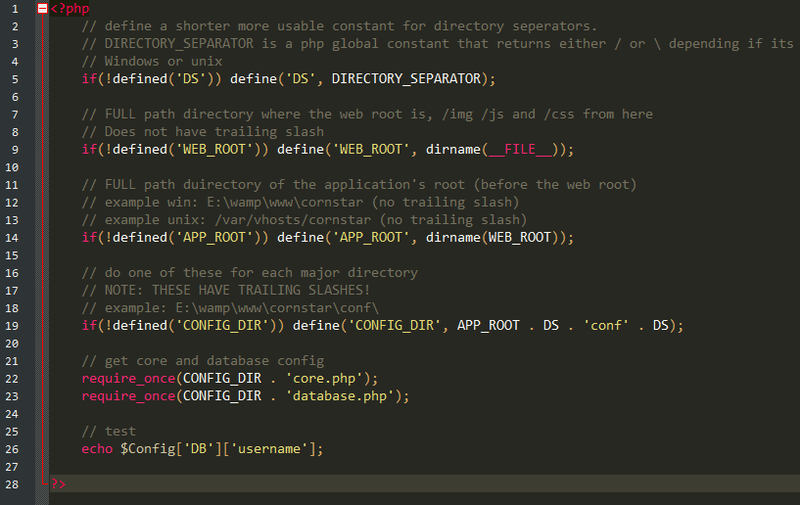 The first one I found was a framework called “cakePHP” [CakePHP about page]. This one seems fairly huge and comes with a lot of little helper functions like being able to create forms and form fields that just work automatically with the controller files [CakePHP form helper]. After downloading it and trying it out (also free! ), I see they use almost the same structure that I’d planned with Cornstar with the controller and view folders, and setting constants in the main index.php file, except that it uses a templating system that outputs the “content for layout” in the template. The content is filled in with the views. This is different because I wanted to use a header file and footer file for creating templates. I could potentially try this method but I’m not sure how it’d even work. The other MVC one I found was a really simple one “PHP-MVC” by a user called “panique”. [php-mvc]. This one is really simple and because of this, makes it a lot easier to figure out how MVC really works. CakePHP is good, but it’s huge and complicated with a lot of security built in, plus it has a “bake” functionaliy that lets you create entire websites via the console [Cake Bake], which seems pretty useful, but adds a whole extra chunk of code that I probably wouldn’t use for Cornstar. Another thing I notice is that because of the flexibility of cakephp, there’s a lot of other bulk in there that probably isn’t needed, like the ability to join tables with a single function or email template systems. Looking through the codebase of just these 2 systems, I could easily create my own MVC system that works best for only Cornstar. Today I built the database and found that my original plan mostly worked well apart from a couple of things like the friend system, farm sizes and the users table being now called a “farms” table. The first thing I did was created the users table. I ended up re-naming this to “farms” as it makes more sense as each user will only have 1 farm. In this table, I also split off the width and height of the farm into a separate table. This is because I wanted it harder to hack in ambiguous widths and heights and also it’d be easier to link a single set of farm dimensions to the shop system with just IDs. Another idea I had that could be implemented in future versions is that the expansions will be limited by the experience of the user. A user will only be able to upgrade when they are a certain level, and it will also cost game money. This means the farm table will need XP (experience) and level to buy. But doing this to the game would require user level system using XP and saving their level in the database. This would be too much work for a small feature. For the plants I made the “seeds” table a “plants_type” table and made the ID in the seeds table reference this with “plant_type_id”. A little extra thought was being able to use little icons for each of your neighbors. To do this, I’d need some way of either uploading images or linking ones already on the net. Ones that already exist could be a user simply choosing from a selection of icons, or maybe a random image generator using the username as a seed. As uploading may require extra security and cropping, I decided to allow users to simply add a link to their thumbnail. A proper website would need to allow uploads and cropping, but that seemed a lot of work for a small website and would only be something to consider in the future. Today I got my Myo Alpha in the mail to do some sweet codez. The device is pretty cool; it basically lets you “train” it to know about 6 or so “gestures” (like clenching your fist, or swiping your hand) and then uses an accelerometer and gyroscope to send orientation and acceleration data via bluetooth. It wasn’t too hard to set up either. What I did was, when I did the “fist” gesture, I could move the camera’s pitch and yaw with my arm’s pitch and yaw. It may not seem like much, but I’ve technically figured out and programmed in methods that can be re-used and implemented into pretty much all of the game’s controls. Fir instance, I can easily use the same code in another game to shoot with the fist gesture, or jump with a flick gesture, all I need to go is use the glass and methods to check which gesture is being used, and the orientation data cane be accessed the same way. You can even easily make it vibrate. If I had 2 Myos, I could do even more, like move with my left hand and look around with my right. A future project I’m thinking about is something where I can use my arm to create music and special effects, like a fireworks display, just as a cool demo of the controller. This week I worked on the website’s template, setting up the website environment, and adding a source control using GIT and BitBucket. Note that I refer to “cornstar.com” please don’t visit that URL. I’m using this as an example, this won’t be the actual URL. Thanks, and sorry (if you do). The “Config” variable will be one that I will use throughout the application. Although it seems using a global variable is bad practice, I did think of using a singleton class for the database config, but it is recommended by many “up-voters” that singletons in PHP aren’t recommended [Stack overflow]. It looks confusing, but if you have a look at each line, it makes sense. Each of the defines is checking to make sure it’s not defined already, just in case. At the time being, the “core.php” file is empty, but will contain some site options for easier configuration when the time comes. It seems like a lot of code to do such a simple things, but this framework I’m building is key to creating a usable application in the long run. 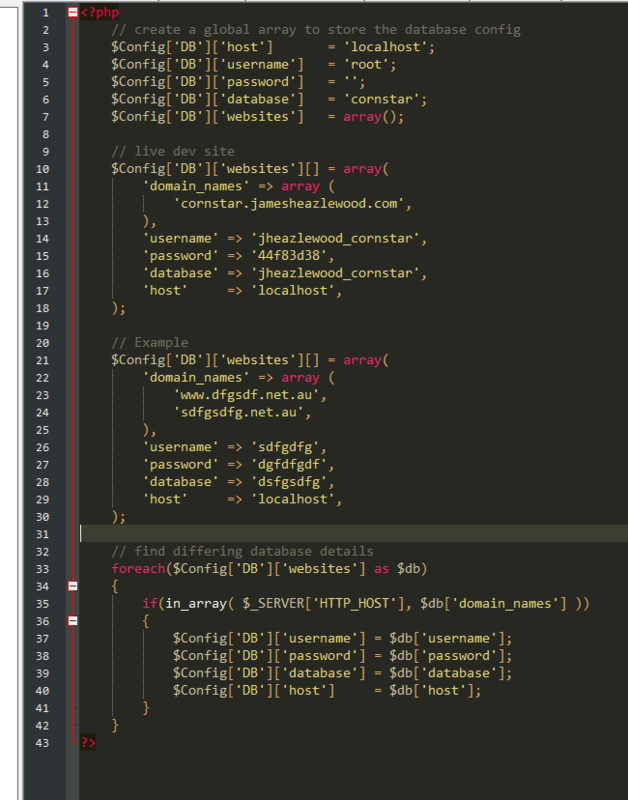 As you can see, I can access any of the database values just with that array. So, towards the middle – end of the project, programming will become a lot easier. I’ve used Bitbucket [Bitbucket home page] for source control as I enjoy GIT over other source controls (another one of those personal opinion things) mainly because I’ve tried perforce, SVN and git, and I just like the feel of git, mainly because of Bitbucket’s interface (and Bitbucklet supports git). Bit is a free version control system, and Bitbucket is also free (for limited use). 2 good reasons (the same reason) to use these. For my Windows use with git, I’ll be using TortoiseGit and Git bash. I need git bash for console commands as sometimes it’s easier to use the console to do git related commands, and TortoiseGit is a GUI for git that lets you use compare tools and context-sensitive settings and tools. (I can right-click on the cornstar folder and push changes from there). I’ll post another entry for the rest of this as it’s pretty long. See you next time. This will be an entry to try and get some goals set in place for this project. Seeing as I’ll be away for 3 weeks of the project, I’m really going to need to create a plan of thing that I need to do and when. Week 1 – 7 : Getting draft design done and database plan. Week 8 – 7th April – start creating the basic files that run the game. Do the front-end rendering of the game interface. Add some controls for adding seeds (just the buttons, dropdown etc, friend buttons). Add files to bit-bucket using version control. Week 9 – 14th April – Create login and join screens and make users get added to database, plus read from database. create a session for logged in users and use a cookie to track their login session. Week 11 – 28th April – Add in functionality for logged-in users to add seeds using jquery. Adding seeds that take out money and all the functionality of planting seeds. Week 12 – 5th May – add functionality for seeds to grow and draw the correct image for each type of seeds plus the stage it is at based on what data the seed gets from the database. Additional tweaks etc. Week 15 – 26th May – extra work buffer – tweaking etc. Week 16 – 2nd June – extra work buffer – tweaking etc. Week 17 – 9th June – Final tweaks to pretty much finished draft and any final additions. Final documentation. Update final online version and hand in. To be able to get the server running on my local machine at home, I’ve downloaded and installed WAMP. This was fairly simple with the default settings and it works fine. It just cannot be run after Skype as they use the same port. The way around this is to simply start WAMP first, and then run Skype. Notice that the DocumentRoot points to the root directory. This is a security measure as all the sensitive scripts and settings will be stored in a directory behind this one. So if someone happens to find a way to access the root directory, they will find it more difficult to get to the sensitive areas. Setting the website up this way allows me to access and edit the website on a root URL “cornstar.localhost” by typing that into my browser. The way I intend on setting up the server will be great for security, organisation, and the MVC software pattern. This structure may be added to as I develop the site, but this is a great start. assignment1 – this is a sub dir where the vhosts refers to. This allows me to have multiple websites without moving files around. root – root of the domain. Typing / after the website domain will be this directory. One of the very early things I like to do is create the database and play with that as it is essentially the hard drive of the game. All data about the game, users and corn information will be stored here. money int How much money in the bank. Will always be whole numbers. * Also used to determine if this has been harvested or not. If not, this will be set to “0000-00-00 00:00:00”. time int Time in minutes that this takes to grow. 40 hours would be 144,000.
sell int Price this item sells for. The reason I’ve chosen to represent the time left on a plant growing with a date planted is because this is safer to use against hackers trying to dynamically make a plant fully grown. If they do this and send to the system that they are harvesting this plant, the system can check when the plant was actually planted, and if the time has been enough, then it can be harvested, and if not, then we decline the request. Another table for this database could be a “Country” table. This will allow people to select their country in a drop-down and would store the country as either an ID or a country code (example: AU). However, this is not an important feature of the website, and the country field will not be required, so I’ve left it a as simple text field. I could have also made the first and last name separate fields in the user’s table, except this sort of this is not important for such a game. If this was a database for a mailing list and you wanted to arrange the users by last name, then that’d be useful. But otherwise there is no point. When making games, I usually start off with assets after planning as usually someone else will do these and I can then focus fully on the programming-side of the game. Because HTML can include buttons and other tools like select box drop-downs, I will basically only need the game board. The only artwork I’ll need for this would be 3 different animations of corn growing and dirt. The game is finished. 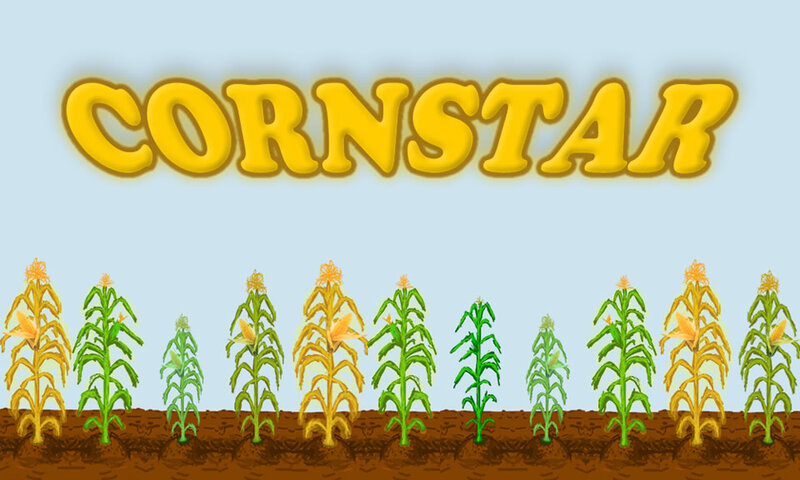 Play Cornstar. Hello. I’m Jimmy, a famous corn star. I grow corn and sell it to make money so I can buy more seeds to grow corn. My life is like watching grass grow. Except it’s corn. 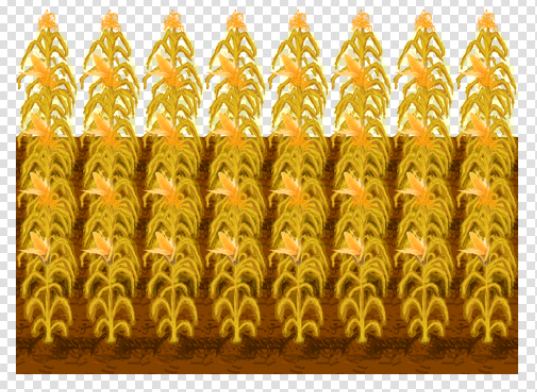 For this task, I plan on creating a very simple HTML game that allows users to plant seeds and grow corn. There will be 3 types: baby corn, juicy corn, and golden corn. The baby corn is cheap to buy and cheap to sell, but takes a lot less time to grow (3 hours). The golden corn is slightly more expensive, sells for a lot more but takes 40 hours to grow. More patient users will use this option. The juicy corn sits in the middle of these. In addition to this, once the user can afford it, they can expand their farm. The idea is that people farm the corn to earn money, and are rewarded for patience, better corn takes longer. Expanding their farm gives them more space to grow more corn, and the cycle continues. Users can then look at their friend’s farms and compare them and their current riches. The database will need to store user data, crop data, and a link table between the crops, which user, and where the crop is planted. The user data will also contain the user’s currency and stats including the number of each type of corn sold. For advanced features I’ll be setting up a vhost on my local machine. This is an Apache “virtual host” that lets me have multiple root domains on my local machine without having to change settings or move folders. In addition to this, I will put the game up on a real server with a database to show it off to friends. Another feature, if I get more time, is to add more varieties of corn. For example red corn, popcorn corn and blue corn. These could be unlocked over time. Another feature could be a bad guy crow that eats your corn unless you get a scarecrow. The scarecrows could be upgraded to be scarier for larger farms. Although it would be an interesting feature to have plants die if they are unattended, I want the game to allow users to come back at any time in the future and have their fully grown plants ready to harvest as having them die would annoy some users. Behind the scenes, the first part of the system will be the login screen. Without being logged in, the user will be able to view their farm but won’t be able to plant anything. The user must use a login button at the top of his or her screen to login and make edits. The actual login screen will be a home-page type of screen displaying a logo and fields to enter their username and password. Once this is done, it will redirect to the user’s farm page. In the farm view, when logged in, there will be displayed the current user logged in, the money they have, and a drop-down (select box) for which seed they would like planted, defaulted to normal corn. Below this is the game board which will look like a typical chess board, but each corn image will be drawn from top to bottom and can grow higher than the square by 3 times. By default, and no upgrades, the user will have a 6 X 2 large farm and must grow corn in this area to afford to upgrade to a larger one, 8 x 3. The next upgrade will be 10 x 4, then 12 x 6, then every upgrade after that adds 4 to the Y axis, for example 12 x 10, 12 x 14 etc. This is because web pages typically are scrolled down rather than across. When editing, the user selects the square at the base of the corn. Clicking an empty space of ground will plant the selected seed. Clicking on fully grown corn will harvest it and give the player money. If the user doesn’t have enough money for a seed, they cannot plant any corn. The user will be able to see their friend’s farms, but need to be logged in to make edits of their own. When viewing a user’s farm while not logged in, there will be a big bright button telling users to create their own corn farm.